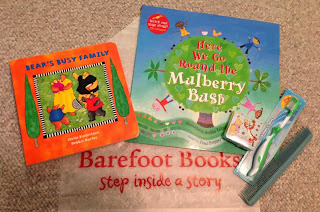 On the eighth day of giveaways, Still Playing School gave to one lucky reader, a Barefoot Books Singalong kit! We purchased several birthday and holiday gifts for both kids from Barefoot Books with Carol Anne Friesen. D is getting new board books (Can I just say that my boy is way harder on his books than E ever was because wow!) and E received the Hoot Owl Hoot! game that was included in my Top Games for Kids Under 5 list, but she'd probably also really love Mermaid Island! "As long as I can remember I have loved children! I was thrilled to have my own two, a daughter and a son and I was fascinated at how they could learn, grow and devlop. Lucky for me I was able to be the founder of the first preschool they attended. They are now grown and have children of their own but I have spent my life as an Early Childhood Educator and loved every minute of it. Since I have moved a lot (my husband is a minister) and I have had to leave behind the two Children's Centers that I founded, I have looked for other programs that are easy to take with me wherever I go, whether I have a "center" or not. As a Kindermusik Educator and Baby Signs Instructor, books have been an important part of my programs, so when I found out about Barefoot Books I was thrilled. These are quality books, that are well written, beautifully illustrated and a wonderful compliment to the other programs I offer. Best of all I can offer them to other parents and grandparents to enjoy with the "little ones" in their lives!" We met Carol Anne at E's first Baby Signs workshop (We also met the best friend that E now refers to as her "life boyfriend" but that's another story!) and she's been like a part of our family ever since! This year she invited us to help her pack Operation Christmas Child boxes to share her love for children all over the world. Everything she touches turns to gold, especially her programs for families. Her love for them shines right through it all. If you live local your child can enjoy a new Barefoot Books Home Kit every 5 weeks as part of her “Mother Goose Music Time” classes. Through music, movement, books and little instruments your child’s life will be enriched! Go to Welcome Little Ones for more information. Also, Mother Goose Music Time is available to come to your child’s daycare or preschool. Carol Anne will bring all the musical learning fun right to your classroom along with her wonderful Barefoot Book resources. Enter to win this Barefoot Book Singalong which features “Here We Go Round the Mulberry Bush" that highlights all the routine times in your child’s day. From the way we jump out of bed and brush our teeth to how we comb our hair, the enhanced CD includes video animation and audio singalong. In the board book “Bear’s Busy Family” follow Bear through his day as he prepares for a family feast. This Barefoot Kit will feature these books and resources as well as some other “surprises” to help your child develop healthy habits! Please join us back here for the next four days of giveaways! We love Barefoot Books! Hope I win!! As a teacher I've always loved the bear books and my son does too! We also love to read moose books with Grandma so "One Moose, Twenty Mice" would be sure to be a favorite. The illustrations in The Snow Queen look beautiful! My daughter LOVES the Bear books! We have collected them over few years that we have known Carol Anne, and I actually just ordered her the rest of them to complete her "collection" for Christmas! I love love love these books! We have a few, but you can never have too many!!! Up, up, up! is our favorite book and singalong cd here!!! !